Firstly, thank you again for all the support during the Greenlight process. It was amazing to get such great feedback and to get the go ahead to go on Steam. 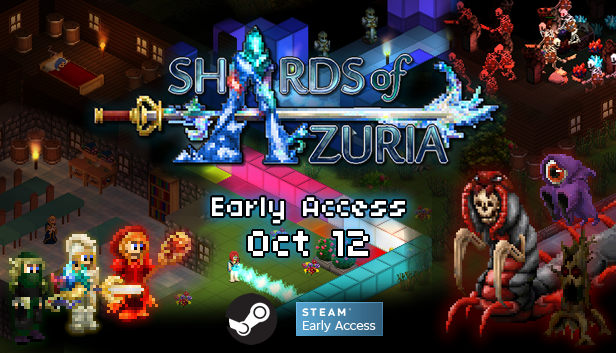 I'm now very happy to announce that Shards of Azuria will be coming to Steam Early Access on October 12th! The inhabitants of Azuria will assist you on your journey, helping you obtain many Abilities or to satisfy your creative endeavour. Wander into the unknown, build a home and become strong enough to face the lurking evil. 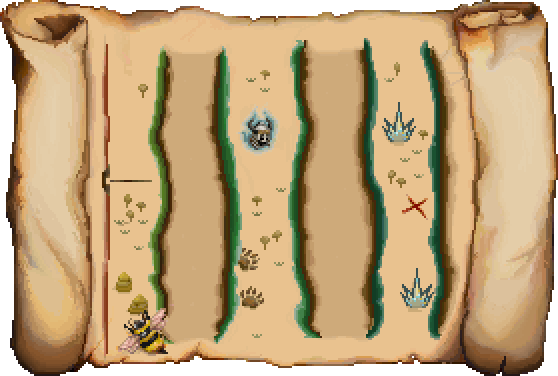 Aquire items from fallen enemies or stumble across rare crystals. Use what you find to craft a variety of items, including weapons, armour, decoration or abilities. Pick and mix between what you equip or use from 3 different class types. Most Abilities are aquired through crafting with the support of the 3 class trainers that live in Azuria. The trainers will guide you the process of becoming adept with Mysticism, Cunning or Might. Choose to play with any of the 15+ Abilities of those types. Dig, destroy walls or build your own home. Shape the area to your desire. Then add colour into the mix with the Paint Blaster! We feel that Shards of Azuria is a game with the option of extended content in most areas. It is very much a template to allow for further development and on going improvement. But the scope of further development will also depend on the overall reception and interest in the game. Below is a list of potential features that may be developed over time. We are Blue Potion Games, two individuals that began a journey to develop a game around jobs and without budget. Developing around a day job is a slow process. It has taken a long time to get this far. The aim is to bring Shards of Azuria to Steam into Early Access. If this is achieved with your support, then we can further develop the game at a more efficient pace. Please feel free to follow us! Isometric terraria/Final Fantasy Tactics cross-over? This looks great. Reminds me of old school final fantasy! Good Job! Upvoted! Followed! Favorited! Can't wait to get my chops around this! Thank you ALL immensely for the support! We are at 300 votes now and climbing! -The game does indeed run in windowed mode (best so). -There are already Keybind options for mostly all player input (movement, ability usage etc). In terms of "Action RPG", I'd say the combat is definitely more indicative of that genre specification. Other aspects of the game are more of a mix between "sandbox" or "story" features. Shards of Azuria has been Greenlit and is now listed in the Steam store. For the latest information, purchase options, and discussions for Shards of Azuria, please see it on the Steam Store or in the Steam Community.